Snail bob was relaxing in his new home and the days were passing by really fast. He suddenly remembered that his grandpas birthday was today and he needs to start moving now if he wants to reach his house in time as he moves really slow. He first needed to think of a good present for him, and he was lucky to have a really pretty flower in a pot. Wrapping it up quickly, he now is heading towards the house, but the forst is really dangerous. You will have to use all the switches correctly to make it there. Activate them in the right order to clear the way so he can pass slowly through the hollow tree trunks. Try not to get him killed in this adventure game and he will surely thank you as well as his grandpa. Use the mouse to activate the switches, buttons and winches. Click on Snail Bob to make him hide in his shell and stop moving. 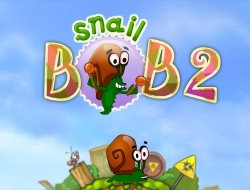 Snail Bob 2 0.00 between 0 and 10 based on 0 votes.